1. This is the first time I have actually been contacted by an author to review a different book I already had scheduled. I am curious as to how she found out, but am really excited that she did because this means someone is reading my musings, so that is a good thing! 2. I had actually finished reading the first book and was just about to publish the review when Ms. Stanley contacted me. I am a voracious reader, so I am actually weeks ahead in my reading. Since I have not had a chance to write any of my reviews yet, I figured what’s one more book! So I readily accepted the invitation to read and I am so glad I did. Trust Me Twice is the story of two friends, Alana and Zac, born on the same day and actually grew up across the street from one another. Unfortunately, just as things were starting to develop, Zac and his family moved away. The good news though is that seven years later, he comes back with his family, a little bit older and a little bit different. all wrong and that’s when things get progressively worse. Oh those teenage years! They were awful for me and I can so totally relate to the storyline so far. Clearly Alison remembers what it was like to be a teenager because the characters she crafted were entirely believable, right down to Alana’s jealousy of the popular girls and the dialogue between Zac and the other teens on the school trip making fun of Alana. Such a huge betrayal of trust But that is where the relating stops. I never had a boyfriend while I was in school, so I didn’t have to pine for one years and years later. But I know what it’s like to be betrayed. Ironically, I have been attending a Bible Study Fellowship program and one of the things that we talked about is the fact that even though things don’t always make sense in our lives and prayers are not always answered the way we want them to be, God really does have a plan for each and every one of us. What we need to remember is that He is the one that is driver’s seat and we need to follow the path he is setting out for us. 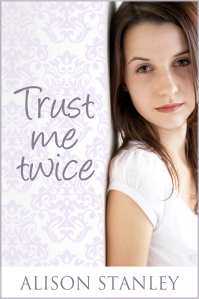 Trust Me Twice is a beautiful story that demonstrates how God doesn’t always answer those prayers in the manner we want, but in the end, He does finally get us to the point we were asking for in the first place. While the journey He takes us on is not the most direct route, we eventually end up in the exact spot we asked to be in.